Jimmy Sturr is Comming Back! 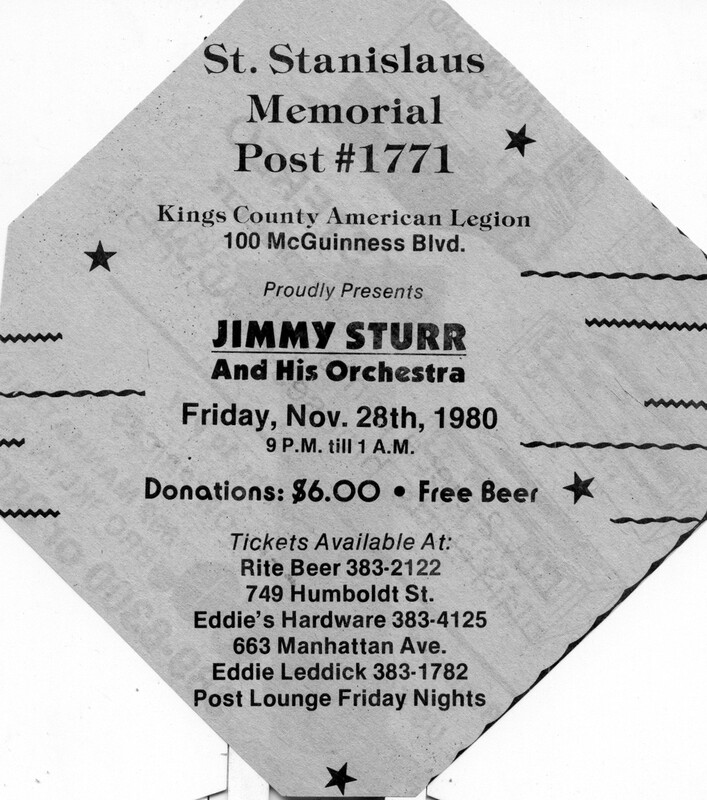 Last Saturday, The Matus z Dancers had Jimmy Sturr at their affair which was held in St. Stan’s Post. 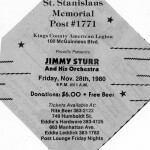 St. Stanislaus Memorial Post, American Legion, for the third successive year, is sponsoring a dance featuring the delightful tunes and syntilating rhythms of the Jimmy Sturr Orchestra on Friday, November 28. Donations are $6.00 per person. The Beer is on us. What better way to have a nice long weekend? Starting with Thanksgiving Day and a delightful meal of “Thanks,” stuffed, relaxing by watching the afternoon football games or visiting some relatives. Comes Friday, you still feel stuffed. Right? Come to St. Stan’s Post that evening and work off some of the poundage you gained Thursday by dancing the Polka! Oberek! Mazurek! Disco! and more! Yes, THE NO.1 POLISH BAND IN THE NATION will help YOU have a most enjoyable evening and loosen you up! You’re going to get tired? Heck! You’ll have Saturday and Sunday to rest! You can get your tickets at Rite Beer, Humboldt and Norman, at the Post Lounge, 100 McGuinness, any Friday. While shopping on Manhattan Avenue at Eddie’s Hardware, 663 Manhattan Avenue. Strongman” Ken Patera To Headline Wrestling Show At St. Stanislaus Post! 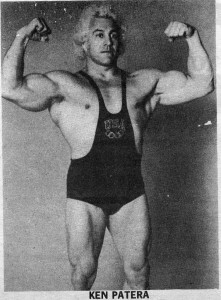 On Wednesday, Nov. 5 at 8 p.m. Ken Patera will defend his intercontinental belt against the former champ PAT PATTERSON. RICK “FAST-DRAW” McGRA W returns to one of his favorite arenas (so he says) to meet “Speedy” Jose Estrada. The sixth bout of the evening will feature Angelo Gomez against Steve King (which should be a good scientific match. On Saturday evening, No­vember 1st, St. Stanislaus Post will tender a testimonial dinner in honor of Jr. past commander Al Kowalski, at Post Headquarters, 100 McGuinness Blvd. Al has been a member of the Post for nine years. He has served on the Executive Committee of the Post for eight of those years. He served as Membership Chairman for two years, and as Hospital Visitation Chairman for one year. He has been the Editor of the Post Bulletin since 1973, and of course we all know of his weekly “Legion Comer” column in the Greenpoint Gazette. In 1978 Al received an appoint­ment as 2nd District Sgt. At Arms, American Legion, Depart­ment of New York. Al has been married for 36 years, and his wife Josephine is also a member and former officer of St. Stanislaus Post. They have four daughters. Anyone interested in attending AI’s dinner should contact Nick Stefanizzi at 383-2122 for tickets. 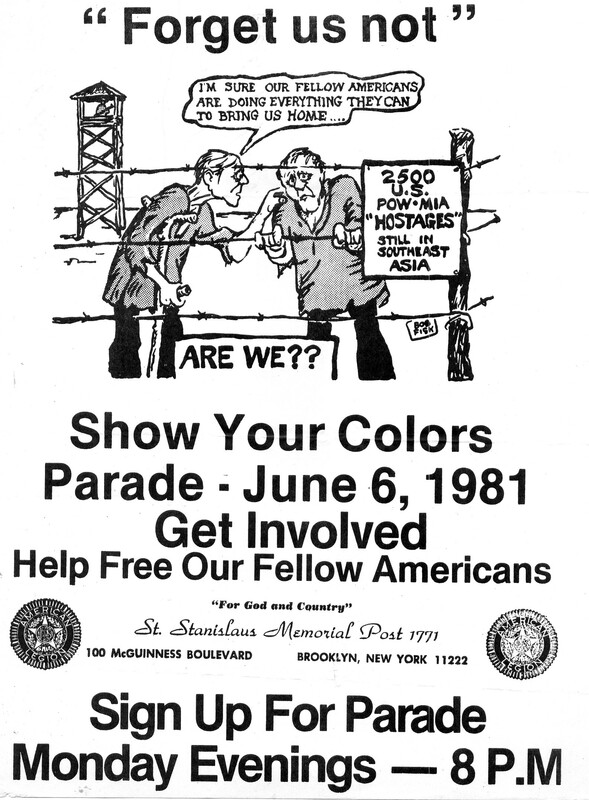 St. Stanislaus Memorial Amer­ican Legion Post #1771 has announced, that as part of its first communication for the 1980-81 year with the public officials representing the Greenpoint­ Williamsburg community, advis­ing them of foreign policy positions supported by the membership. Post Commander Charles M. Merjave indicated that the post reviewed the positions advocated by the American legion’s Foreign Relations Committee and is urging our public officials’ to introduce and/or support legislation to implement the policies or programs. He indicated that the action(s) taken by Represent­atives Shirley Chisholm & Fred­erick Richmond and U.S. Sena­tors Daniel P. Moynihan & Alfonse D’ Amato Will be monit­ored and advised to the member­ship. The policies supported include: opposition to all forms of international and transnational terrorism; opposition of all forms of communist aggression and expansion; support for human rights for those enslaved inside the captive nations; support of the V.S. Constitution over all treaties and United Nations covenants; supports an annual review of United Nations activities by the Foreign Relations Committee; supports the governments of Southwest Africa and South Africa as being in the national­ interests of the U.S.; urges continuation of efforts to identify and recover MIA’s in Vietnam supports continued efforts to promote peace and trade with the People’s Republic of China while supporting the Republic of China (Taiwan) economically, militarily and psychologically; and opposes withdrawal of U.S. armed forces from Asia, espec­ially the Republic of Korea and the Republic of China. Additionally supported was: the maintenance of a strong NATO effort to free the U.S. hostages held in Iran; sanctions against the Soviet Union until Russian Troops are withdrawn’ from Afghanistan; maintenance of good relations and cooperation with Argentina and Mexico; the withholding of taxpayer’s funds by the U.S. House of Representatives to implement the Panama Canal Treaties; and the giving to NATO weapons systems which are qualitatively superior over the Warsaw Pact forces. Opposed was any SALT AGREEMENT which would make the C.S. inferior and any cooperative policies with Cuba until that country ends all acts of aggression. Residents and veterans are urged to write their representatives and express their opinion(s) on these issues. Plans for community participation in the observance of American Education Week, November 16-22, were released today by St. Stanislaus Memorial Post 1771 of the American Legion by Post Commander Charles M. Merjave. Throughout the United States, the American Legion is urging nationwide observance with the theme: Edu­cation in the 80’s Preparation for the Future. Since 1921, the American Legion, its Auxiliary, and other professional groups have promoted, with good cause, the idea of public visitation to our schools. Though the reasons for their initial activities have changed, these groups and others continue to lead the way in seeking the, aid and assistance of every concerned American for better schools. On January 20th, as I watched the emotions of this country turn, turn from sadness to joy, on television, one thought went through my mind. “Hostages are free, so what.” (Don’t get me wrong, Mr. President, I am more than thrilled with their return to freedom. I laughed and cried along with the families of our returnees.) I’m still thinking of families, relatives and friends of ‘our Missing-In-Action in the Vietnam War. What agony, tor­ture, they are going through watching the 52 come to freedom, and their loved ones still in North Vietnam. Isn’t it ironic, we had. so much concern for 52 lives but no con­cern for those hundreds who are STILL in- North Vietnam, being held as slaves. There is proof of their existence, here in this country. The stories were in the papers from coast to coast. Does our­ country look into this matter? No! They are slowly’ writing off the MIA’s as KIA’s. Killed in Action! I am not asking you nor am I telling you but I’m begging you, to rescind that order which is writing off these men as dead. They are alive! They are breathing! They are suffering! They are Americans!! Should we care for one and forget the other? I just can’t believe such a thing is happening in our country! Please, Mr. President, look in­to this matter. Oh, we know, the situation is not the same as it was with the former 52 hostages, but you did call them “prisoners of war.” Aren’t those in Vietnam, “prisoners of war?” Yes, I know this nut is harder to crack BUT not impossible! Take a count of all the Vietnam veterans and multiply by two or three. That’s how many young men, of draft age, this country will have in case our country gets in trouble. Do you think, for one moment, the Vietnam vet will allow his son to be drafted? To fight for a country that forsakes its own? Don’t you think the fear of having this hap­pening again and to their own children will be on their minds? And don’t you think they will help them to go across the border to evade the draft? You know Mr. President, it will be the first time in my life, I would agree with their course of action. Here are prisoners of war being written off and those who refused to fight for this county, through “amnesty,” are back. Forgiven for their sin against the country. What sin did those in Vietnam commit? Obey an order? WHY are they being written off? Your dreams, your goals, shall be the dreams and goals of this administration.” That is how you ended your speech, Mr. President. The goals and dreams of many of us are to keep the spirit alive! The hopes alive in seeing these Vietnam vets coming back home, some day, to be reunited with their families and friends. P.S. Send a copy of this column to President Ronald Reagan. The American Legion is seek­ing contact with any Vietnam War veterans residing in the Greenpoint-Williamsburg community who were exposed to the herbicide Agent Orange during their service in Vietnam and who have subsequently been examined at a Veterans Administration medical center or outpatient clinic. Post Commander Charles M. Merjave of St. Stanislaus Mem­orial Post 1771 announced today that this local American Legion organization was participating in the Legion’s nationwide program to monitor the VA’s screening of the Agency Orange victims. He stated: “The American Legion is seriously concerned about the effect of Agency Orange on those Vietnam veterans who were exposed to it when it was used as a defoliant. More than 30,000 veterans have been examined by the VA, but there is doubt about inconsisten­cies in the quality of these examinations and the American Legion is committed to gathering information. Until conclusive sci­entific evidence is available, determining exactly what (if any) conditions may be attributed to Agency Orange exposure, The American Legion will continue to counsel veterans who are concer­ned that a current health problem might be related to such expo­sure, or the fact that they were exposed might pose some poten­tial health related problems. On Tuesday, January 20th, Rite Beer Distributors hosted a party for its neighbors and Customers in celebration of the release of me hostages. The St. Stanislaus Memorial Post and the Humboldt Street Block Association cooper­ated in a touching ceremony, organized and hosted by me Stefanizzi family. It was a real old fashioned party with a barrel of beer, other beverages and coffee and cake available for all on the sidewalk in from of Rite Beer. The ceremonial ringing of me bell, and cutting down of a yellow ribbon was followed by fireworks, sirens and the singing of God Bless America and “Sto-Lat”. The festive mood was every­where. The proceedings were covered by Jim Ryan and Channel 4 News on television Tuesday night. In an emotional T.V. interview Nick Stefanizzi Sr. said he felt a relief and happiness as if a member of his own family or close friend or neighbor were I being released. St. Stanislaus Memorial Post 1771 has urged President Ronald Reagan to immediately appoint a special Presidential Commission to launch an investigation to obtain a full and complete account and the whereabouts of the members of the Armed Forces, of the United States (prisoner-of-war/missing in-action) who are being illegally held in North Korea and in Vietnam. Post Commander Charles M. Merjave indicated that the two year old post initiated special MIA Committee, under the co-chairmanship of Nicholas Stefanizzi, Jr., PC and Edward J. Wizbicki, received a substantial appropriation at the last membership meeting to utilize for lobbying for movement on this tragic matter. Besides communicating with President Reagan, the post has requested U.S. Senators Daniel P. Moynihan & Alphonse D’Amato, Congress persons Frederick Richmond & Shirley Chisholm and Secretary of State Alexander M. Haig Jr. to support the establishment of a special Presidential Commission. St. Stanislaus Memorial Post 1771 urges you to immediately appoint a special Presidential Commission to launch an investigation to obtain a full and complete account and the whereabouts of the members of the Armed Forces of the United States (prisoner-of-war/missing-in-action) who are being illegally held in North Korea and in Vietnam. Recently, significant live sightings at Bai Bang were reported by non-American citizens who saw. the Americans on a slave-labor detail. Rear Adm. Stephen J. Hosteltter, the senior member of the United Nations Command, Korean Military Armistice Commission, has confirmed that 389 American prisoners of war are still unaccounted for by the North Korean and Red Chinese from the war in Korea. Retired Lt. Col. Albert Shinkle, in testimony before the House Subcommittee on Asian and Pacific Affairs, indicated that he was able to determine that a large number of U.S. servicemen were prisoners of the Communist Pathet Lao as recently as 1975. Of the 2,546 American servicemen not accounted for at the close of the Vietnam War, 559 were reported missing in Laos. 550 men remain lost in Laos. Marine Corps Pfc. Robert R. Garwood has publicly stated that Americans are still in Vietnam. He returned in March. 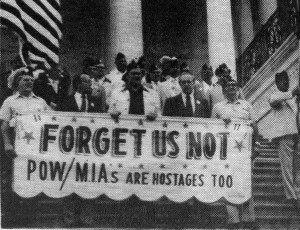 We believe that our country has not devoted enough effort to obtain an accounting from North Korea and Vietnam of the POWs/MIAs. In fact, it appears that this subject has been swept under the rug to be forgotten. Please advise us of the steps you plan to initiate to start the process to end the tragedy of Americans continuing to rot in Asian hellholes. We give a damn, as we know you do. Nicholas Stefanizzi, Jr. is urging all Greenpoint-Williamsburg residents to write President Reagan and request him to act now. The address is: Hon. Ronald Reagan/The President of the United States/The White House/Washington, D.C./20500. You’re not obligated to sign up that very day. We are not that pushy . We do need you as much as you need us. As a team, we can accomplish more than trying to do the same individually. All you need for admission into the Post is your discharge papers or a copy of the same. Come on down and bring another Vet. REMEMBER THE DATE! FEBRUARY 22nd from 2 p.m. to 6 p.m.
WWI – Apr. 6, 1917 to Nov. 11, 1918. Please remember in your prayers our still Missing-in Action and Prisoners of war who are STILL in North Vietnam. They are being written of as killed in action. How could they be? They are alive and breathing. Let’s get them back as we did the hostages in Iran. There has to be someone, somewhere who will listen. These men, boys, ans­wered the call from Uncle Sam. Now, should they be forsaken and forgotten? They have the rights to live a free life in these United States as you and L Think about it. Suppose it was one of your sons or cousins or friend, there in captivity, in slavery. What would YOU do! Do the same for them. St. Stanislaus Memorial American Legion Post #1771 has requested State Senator Thomas J. Bartosiewicz and Assemblyman Joseph R. Lentol to support the 1981 Legislative Program advocated by the American Legion Department of New York. Post Commander Charles M. Merjave indicated that a recommendation to support the various items in the total program was unanimously passed by the mem­bership. *Passage of legislation provid­ing for the payment of a bonus to , Korean and Vietnam Veterans. *Passage of legislation that will amend Section 458 of the Real Property Tax Law in order to preserve Veterans Real Property tax exemption on a percentage basis if assessment changes. *Passage of legislation that will obtain prior service pension credit for war and conflict service to all war veterans in all retirement systems in New York State. *Passage of legislation that will establish a permanent standing committee on Veterans Affairs in both houses of the New York State Legislature. *Passage of legislation manda­ting that the death penalty. be administered upon those persons found guilty of committing felon­ious crimes previously covered by the death penalty statute. *Passage of legislation which will require a course on American History and Government be a mandated requirement for graduation from any public or private high school under the jurisdiction of the New York State Board of Regents. *Passage of legislation, which will authorize the establishment of a New York State Veterans Cemetery. *Passage of legislation that will restore Civil Service Preference to veterans in reduction or abolition of jobs. *Passage of legislation which will amend present law and require the State of New York to use the date established by the Federal Government with respect to the closing date of the Vietnam War. Vice-Commander William Janovcsik, chairman of the Mem­bership Committee, indicated that the legislative goals were realistic and could be achieved if the veteran, his family and neighbors speak with a strong united force. He urged honorably discharged veterans, who’ are not members of the American Legion, to join and participate in the many worthy programs sponsored by the American Legion. Applications can be secured by visiting the post (100 McGuinness Blvd.) any _Friday evening after 7 p.m.
Our Father who art in heaven, hal­lowed be Thy name; Thy Kingdom come; Thy will be done on earth as it is in heaven. Give Us this day our daily bread; and forgive us our trespasses as we forgive those who trespass against Us; and lead us not into temptation, but deliver us from evil. Amen. The crowds that saw the parade on Manhattan Avenue and Nassau Avenue, were not to expectation. We felt, more people would be out to see what we are trying to accomplish. We haven’t given up in getting the message across. The POW IMIA Committee would like to acknowledge and “Thank all the organizations who participated in this parade. Leading the parade was the 26th U.S. Army Color Guard, followed by our invited guests. I mentioned them last week and omitted three names. I shall rectify that, at this time: First, Mr. Joseph Saia, a very good friend to us and to the Post Mr. Saia is a Past County County Commander of Kings County American Legion and a Past Department of New York Vice-Commander. (Sorry, Joe). Of all people to forget was our own Post Commander, Charles Merjave and the Unit’s President, Kathy Hayward. My apologies. Back to the acknowledgements Our Grateful “Thanks” to the 26th U.S. Army Band, who did one “helluva” job. To the members of St. Stan’s Post who turned out and the Ladies Unit. Bedame-Sessa Post; George Davis Post; Watkins-Kellet Post from Staten Island; Voiture “17-Loco 40/8; and Nassau Voiture Loco from Nassau County; Charles Wintis Post; and Hank Bialous, from St. San’s Post with his car decorated. All the above mentioned are from the American Legion. Joining us were the John Czachor Post, V.F.W. ; George Washington Post, P.L.A.V. ; George Black Post. This completed the veteran groups. From the Greenpoint Community and adjacent areas marching together with us were; The Little League; Fermi-Pulaski Club; America Free Club; National Civic Club; Kiwanis Band; Chopin Citizens Club; The ever present Green Oaks Club; Ascension Church; Huron-Green St. Block Association; Two organizations, who are under one banner of the Knight’s Columbus, Fidelity Council and Lexington Council. Anything pertaining to “God and Country,” they never say “no.” Yes, the Bushwick Lions Club was also there. Our “special” thanks to Capt. Richard Schriefer, to his men in the 94th Precinct and the Auxiliary Police and to Patrolman Walsh of the Community Affairs Division in the 94th Precinct for helping us coordinate the event. If I left someone out up to this point, it was intentional. There was one group who assisted our “Men in Blue” throughout the entire parade, C.O.P. is their initials. Civilian Observation Patrol, when you spell it out. Under the capable hands of its coordinators, Joe Reemmer and Mike Carlo, this group never relaxed, until the whole parade and the speeches were over. In assisting our Police Department throughout the three hours, riot once did they relax in their endeavors. Greenpoint should be proud, as I am, to have such an organization in their midst. A voluntary group, which helps our Police Department in protecting you and your property. Gentlemen, 1771 “Salutes” you. “How Long Must They Wait!” is on the big sign on the side of our Post. “How Long Must They Wait!” is on the mind of every family who has a loved one in Southeast Asia. “How Long Must They Wait!” is the battle cry of every veteran who ever served in the Armed Forces. “How Long Must They Wait!” is the cry of future Americans who will be of draft age, hoping they will not meet with the same fate. “How Long Must They Wait!” How long? This earth is not one big apple and the human living on it, to be discarded like a pit, dropped by the wayside and forgotten. You have seen our Post mem­bers, Legionaries, on the Avenue. If you didn’t notice, they were petitioning you for signatures. They will be there again, throughout this month of May. All these signatures we’ll be taking to Capitol Hill, in Washington, D.C. to our legislators. I must be one of the most naive persons alive, when it comes to politicians and our government. I can’t get it through my head to believe these critters that we “should” trust with the affairs of the country. I start having doubts of every man who runs for any of­fice and wins! They talk one way while running for the office and talk another way AFTER they win the office. Take for example, our President. In 1976, on July 26th, he sent a telegram to the National League of Families at their seven­th annual meeting. It states in part: “… The first week that I am President, a new Secretary of State will begin immediately taking every reasonable and proper step to return any live Americans still held in Southeast Asia, to secure an accounting of Americans still missing in action and to repatriate the remains of American dead. You have had to wait too long for action.” Ronald Reagan. On March 16th, representatives of the American Legion met with the President and in response to a question regarding POW’s still held in Southeast Asia, the President replied: “My under­standing from the chairman of the Committee is that there is little reason to hope that anybody is still alive.” The Chairman is Robert (Sonny) Montogmery. The same man who doesn’t believe in secondhand information! I doubt very much if Mr. Montogomery’s Committee has done any kind of research, questioning those com­mittees are capable of doing. Is there someone, somewhere, telling all to keep their nose out of this? 2,464 persons just don’t disappear from the face of the earth. Why was the President in a dif­ferent frame of thought AFTER he was elected, on the POW/MIA’ matter. Does he know something now that he didn’t know before’ the election? Incidentally, did you know that all the information the President receives is second hand? How else could he function if he didn’t have aides to help him run the country? Join us in this crusade. Sign the petition when you are asked. Join us in the parade on June 6th! Come down on Monday and let us know you are going to march with us! The address is 100 McGuinness Blvd., Time: 8:00 p.m. All organizations are invited. All churches and their parishioners are being asked. We’ll be there…waiting…God Bless. By the St. Stanislaus American Legion Post will try to impress upon the parents, youth, churches and organizations that it “Behooves all of us to attend the Drug Abuse Forum at Post Headquarters, 100 McGuiness Blvd. at 7:30 P.M. Thursday, June 18th, 1981. In a joint statement by Commander Charles Merjave and Past Commander Richard Fitz­gerald, they said they are doing everything in their power with the aid of the Gazette and Adele Haines to have as many people, churches, and organizations at­tend this “Town Hall” meeting. Merjave and Fitz stated we can only do our best to put the facts to our community and let them pick up the gauntlet to start an all out war on marijuana and other drugs. We hope to see other groups in Greenpoint become an off shoot of our program in combating Drugs by making parents and children realize the dangers of drug abuse and make known those who are trying to legalize drugs and make a fortune out of this. People in our government really believe that it is cheaper to legalize drugs then to prosecute and jail the offenders. All this will be brought forth in our “Town Hall” meeting by our experts. People of foreign nations have been lead to believe that all Americans want drugs and want to legalize drugs. Because of this belief, farmers in these foreign countries have stopped growing fruits and vegetables for export to the United States and are now growing marijuana and other insidious drugs. The money on the open market give them a much better profit. Once again Merjave & Fitz state we have the building, the forum, the experts; all we ask is that you attend. We also, hope to have the “T.V.” media prevent hoping to awake other commu­nities of this surge and what we all should do. We of the Post are proud to say we are the first to present this program in Brooklyn through the Anti-Drug Coalition. As we mentioned last week our experts are Dr. Ernie Shapiro, Professor Fernando Oliver and David Goldman. We also picked up a new member, we call him our “Doctor Quincy,” he is Dr. John Graverholz, Deputy Medical Examiner of Suffolk County. People of Greenpoint have notified every elected official of this program in person or through their representatives. We hope they will attend, we don’t want to have any drug decriminalized and we want to know their stand on these problems. Fitzgerald said at this time I would like to publicly thank the following post members for their ever-needed assistance. Lefty Nurtatomasu, Walter Rachwalski, Bill Janovscik, Ed DuBowski, Ed Leddick, Henry Bialous, Nick Steffanizzi SR. P.c. and John Montagano P.C. Fitzgerald states “People of Greenpoint and Williamsburg” watch for our flyers, posters and letters during next week. We need your help, ask your churches how much they are getting involved. 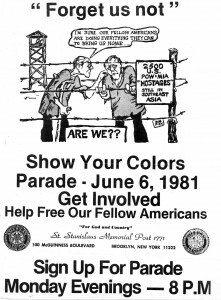 On Wednesdays, June 10th, a busload of members of St. Stanislaus Memorial Post 1771 went to Washington, D.C. to present over 9,000 signatures on petitions to Congressman Fred Richmond, urging President Reagan to take immediate action in pursuit of freedom for Americans still being held captive in Southeast Asia. Congressman Richmond promised to present these petitions to the President along with the strong feelings of our neighborhood on the P.O.W./M.I.A. issue. Chairman: Nick Stefimizzi, Jr. praised Congressman Richmond for his­ help and strong support on this critical issue. The Post members spent the day lobbying ‘various representatives in Washington on this mat­ter. Included in this effort were Congressmen Richmond, Biaggi and Zefferetti, Congresswoman Shirley Chisholm and U.S. Senator Alfonse D’ Amato. New York Department Commander Alton H. Carpenter of the American Legion attended a Department seminar on mem­bership which was held in St. Stan’s Post on August 15th. This was the beginning of the Legion campaign for 1981/82 member­ship drive. In attendance were the De­partment Adjutant, Leonard Baxter; Membership Chairman John (Jack) Harris, who chaired the seminar and distinguished of­ficers from the 1st, 2nd. 9th and 10th Districts which compose the southern part of New York State. National membership and Post Activities Director, James L. Adcox was also in attendance. The seminar lasted five hours starting with the signing in of the guests from the districts, with a lunch break at 1 p.m. The seminar concluded a little after three with the Department. Commander and his party heading for Syracuse for a seminar there on Sunday. If I may, I’d like to acquaint you with our newly elected Com­mander. He was elected at the Department Convention this past July 18th. He served with the United States Air Force during both WWII and the Korean War. He comes from Sidney, New York and is a 24 year member of Harpursville American Legion Post No. 1596. He’s been a lift member since 1969. Al is a Senior Analyst with the Bendix Corp. in Sydney, N.Y., where he’s been employed for over thirty years. Since leaving the military service, Al has worked for the American Legion in many capac­ities; including Post and County Commander, District Adjutant, department Membership Chair­man and Vice-Chairman as well as Department Historian for 7 years. He also served on the Department Resolutions Com­mittee and the Headquarters Relocation Committee. On the National level, he is presently in his 5th year as the, Commander’s Representative to , the National Legislative Commission. He was National Historian during the 1976-77 Legion year. Among other things, Al is a member of the Department and National American Legion Press Association. Al has been and is active in his community which would take another column to write! He is well known in his neighborhood.